The bills that would set up a public option for health insurance across Washington State made it out of committee in both chambers ahead of the first committee cutoff this session. In the House, the plan has changed minimally since its public hearing. The Senate, though, has made additional changes that are more substantial. Gov. Jay Inslee requested the bill after announcing his proposal for the plan in January. Under the proposal, plan providers on the Washington Health Benefit Exchange would have to use a standardized benefit model and develop up to three standardized plans in each actuarial-value tier. In the original bill, non-standardized plans would be phased out entirely by 2025. 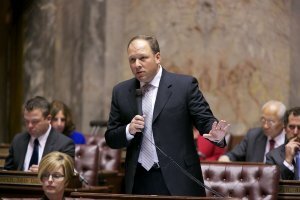 The Washington Health Care Authority would also contract with at least one provider to offer new plans, referred to as “Cascade Care,” that would compete with the others. The goal of the public option is to increase the transparency, affordability, competition, and availability of plans across the state — there are currently 14 counties with just one plan available on the exchange. In the House, the substitute bill that’s now in the Appropriations Committee gives more flexibility to the standardized silver plan, rather than requiring it to have an actuarial value range of 68 to 70 percent — a requirement in the original bill. Note: A plan’s actuarial value is the percentage of expected, average health care costs it covers. For instance, if a person has a plan with an actuarial value of 70 percent, they’ll likely be responsible for about 30 percent of the costs of covered care. Rep. Eileen Cody, the bill’s lead sponsor and Chair of the House Health Care & Wellness Committee, said the flexibility was necessary because the federal government changes the actuarial value for the tiers year to year, and plans in the silver tier are tied to cost-sharing subsidies — subsidies that reduce costs for lower-income enrollees. The House bill now also requires Cascade Care to use a managed care model that includes care coordination and care management for enrollees. This, Cody said, clarifies the bill’s original intentions and mirrors the federal government’s language for Medicare Advantage plans, which offer benefits through private insurance companies. In the Senate, the substitute bill includes both of those changes and an additional two. One additional change in the Senate substitute allows for two non-standardized plans per tier after 2025, rather than phasing out non-standardized plans entirely. In the hearing, Sen. David Frockt — the Senate bill’s lead sponsor — said that the change was due to feedback from organizations like Managed Care Organizations and the National Federation of Independent Business. “We heard testimonies…that having a couple of different options in the timeframe makes sense to give a little more flexibility,” Frockt said before the committee voted on his substitute bill. The other change requires Cascade Care plans to reimburse critical access hospitals and sole community hospitals at at least 101 percent of allowable costs, rather than at Medicare rates. The original bill — and the House substitute, still — requires the state’s Cascade Care plans to pay providers rates that don’t exceed Medicare rates. It’s the piece of the bills that attracted the most criticism in both chambers’ public hearings. 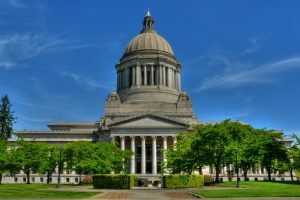 Medicaid rates of reimbursement are 50 percent lower than Medicare rates, in most cases, according to testimony from Meg Jones, who represented the Association of Washington Healthcare Plans at the House bill’s public hearing. And private insurance companies reimburse at rates much higher than Medicare. That means that doctors would receive more money for treating patients covered by Cascade Care plans than for patients covered by Medicaid, and less than for treating patients covered on the individual market. Critics of the bill argue that the rate cap would limit the networks available to Cascade Care patients, decrease doctors’ availability to Medicaid enrollees, and “destabilize” the health insurance market as well as rural health care — facilities like those the change in Frockt’s substitute bill addresses. The change, Frockt said, came as a result of input from Sen. Kevin Van De Wege, who works as a firefighter and paramedic on the Olympic Peninsula. “I appreciate his involvement on this, to ensure — if this were to move forward in this form — that rural and critical-access hospitals and sole-community hospitals, their concerns are addressed,” Frockt said. Cody and Frockt have both said the bills are a work in progress. Cody shared a few of the many ideas stakeholders have brought to her. She also said that Regence, a health insurance provider, came to her with an actuary who explained some concerns and offered ideas. This bill was cross-posted on our sister site, State of Reform.